OK, so I love food. If you are human, you probably love food too. The Tailgate Market Fan Club is made up of people who flock to our local Tailgate Markets…reaping the benefit of wonderful super-fresh food every chance we get. It puts us in tune with the seasons, and the bounty of edibles each season provides. Knowing the food that we’re eating was just-picked from the bosom of Mother Earth sustains us in multiple ways. Our kids know the farmers and the bakers. It’s personal, it’s real, and it’s delicious. What is a Tailgate Market? 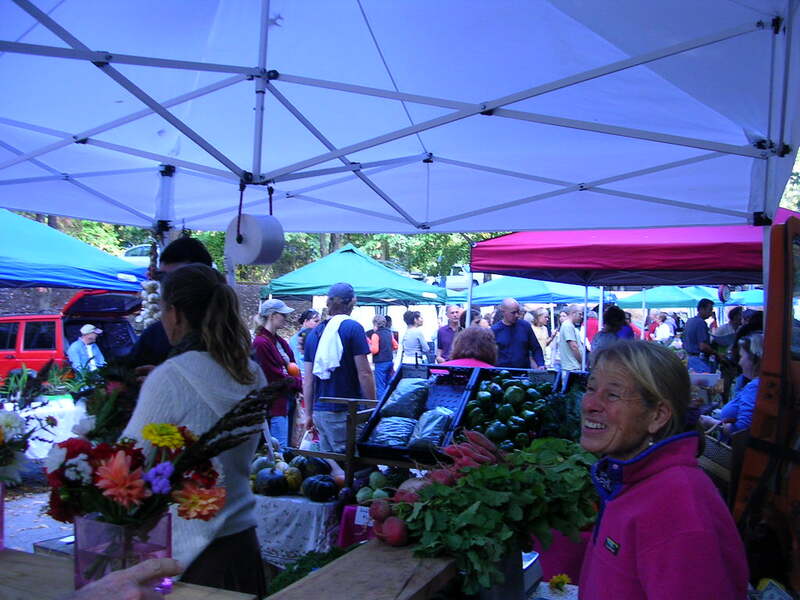 They are farmer’s markets, but in WNC, most Tailgate Markets have very specific rules that require that the food sold at the Tailgate Market was grown/produced by the farmer/vendor that is selling it. It’s not like the big farmer’s markets where people have trucked food in from somewhere else, and they are just re-selling it. Tailgate farmers and vendors do the work themselves. They plant the corn, milk the goat, knead the bread, and make the soap; and we get it right from the source ~ eye to eye with the actual producer. I used to market-farm in beautiful Madison County. One day I was harvesting organic squash for market, when I was nearly moved to tears by the realization that this very squash would be on someones dinner table later that day…someone I might not even know! Whoa. Growing food for strangers to eat took on some kind of profound meaning that I find difficult to articulate, but it suddenly became a very personal labor of love and devotion. Since then, my daughter and I have moved to town; and eating local starts right in our own yard ~ with things as simple as the parsley lining the walkway outside our front door, and our bigger garden out back. Some years the garden is great. Other years I get overwhelmed with obligations, and my garden gets a little scary. Keeping the grass mowed can even be a challenge, but we usually eat plenty of wonderful food from our garden all year-long. The Farmer’s Tailgate Markets will provide garden-fresh food for us all season, no matter what our own garden is like that year. During the season, we make a list of what we need so we can maximize our purchases from local farmers and producers, before we hit the grocery store. It’s not because we are do-gooders, it’s because we get super fresh food that was just picked, and it’s power-packed with flavor. We are the ones who benefit from the farmers’ labors of love. It makes us happy when we eat and cook locally-grown food ~ from farmers we know and like. Around our dinner table, we get a kick out of naming the source of all the foods that make up our meal, and associating a particular farmer’s face with that food. Once the season really kicks in, it’s not surprising when the entire supper has been locally grown or produced (we are lucky to have eggs, meats & fish, cheeses, and awesome artisan bakers at our markets). At parties, the many local-food-lovers & tailgate-market-fans come bearing offerings like goat cheese spread on local breads, smoked trout, and crunchy crudities. At breakfast-time, eating local is easy with bacon & sausage, eggs, and grits readily available almost all year. So that’s my challenge to you, and to myself too. Just how much of this wonderful local food can we manage to enjoy? 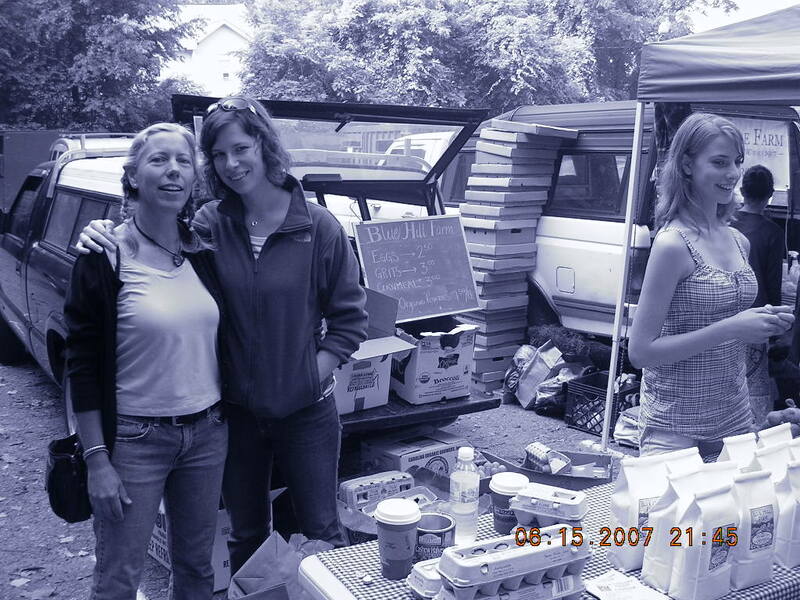 Even in the off-season, many farmers sell at local natural groceries or Indoor Tailgate Markets. Let’s push the window all year long! All content and photos on this blog are (C) Ruth Gonzalez unless otherwise specified. Ruth, I’d like to put up a link to your blog on my strip “Spanglish for Gringos,” in a panel Thursday about “glowing vegetables”, a stab at GMO’s and Monsanto. It’d be nice to back the jest up with a plug for healthy eating and shopping. I found your great blog in an image search, the Salinas post card would be nice to alter – turning it into a night scene with glowing crop rows – and use in the background of the cartoon. It’s short notice I know. I buy from a local tailgater. I think we are simpatico. If I don’t hear back from you in time I’ll post the link but take it down later if you object.